Isaac Newtons theory of gravity is one of the great stories of science. It correctly showed that the moons motion around the Earth, Earths orbit around the sun, and the fact that we all remain safely fixed to the Earths surface were all manifestations of a single force: universal gravity. One of the critical parts of Newtons theory is an equation stipulating that the force of gravity between two objects gets rapidly weaker as the distance between them increases. Called the inverse-square law, it has been tested over the years both by observing the actual movements of the planets and stars and by experiments conducted in labs that examined gravity at the level of a few feet. Of course gravity is strong enough to keep the Earth going around the sun, but thats only because the sun and the Earth are so big. Compared to the other physical forces, such as the electromagnetic force holding atoms together or the strong nuclear force holding nuclei together, gravity is incredibly weak. Lab tests of gravity have to shield against interfering effects from the kind of stray electric fields that can fill an ordinary lab. Electric fields, in the form of radio waves, bloom from just about any powered device in our vicinity, as well as surrounding microwave towers and radio antennas. "The apparatus is an excellent sensor of small forces," said Geraci. "It could be significantly -- 100,000 times -- more sensitive than previous short-range gravity experiments at the micron scale, possibly yielding exciting new discoveries." I assume that the laser beam is considered constant and they will be tracking the changes in position of the glass bead relative to the beam, right? 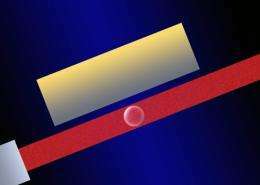 Why use gold instead of some other electromagnetically neutral material? Aren't there oscillating EM fields associated with laser beams that could interact with the gold rod to produce another EM field in the gold rod that might not influence the neutral glass bead directly but could influence the beam itself - by bending it ever so slightly or through some other effect - and therefore influence the motion of the glass bead within the beam? Or am I way off base? I find it amazing that most physicists seem to expect answers in the form of geometry. They have been blinded by the elegance of classical mechanics and have ignored the signs given by quantum mechanics that geometry will ultimately not provide the answers they seek. Furthermore, it seems like the trend is towards hashing out a dozen theories, then waiting for evidence to invalidate the wrong ones. But that is a wrongheaded approach. They aren't asking the most important question, which is, WHY does nature choose one consistent mathematical framework over another? It's as if they think that simply by approximating more and more closely to physical reality, they will find the truth. But no, they will simply approximate too closely and then it will be impossible to refute them. It's really a dire situation. Why is there gravity ? What energy/force is Gravity made of ? I am tired of the same old mathematical modeling, hyperbola, and speculation giving us test data defining what ? That gravity doesn't work past a certain distance or size ? Big Wup. Ouch. Or it could easily be the other way around with the blinding..
Stating that something is undefinable/unmeasurable - or simply that there is effect without cause - sure looks like an excellent and easy sollution - at least to some, but for others it is equal to just putting your head into the sand while you keep praying your mantras in blind faith.. They aren't asking the most important question,which is,WHY does nature choose one consistent mathematical framework over another? Casimir force is an evidence of extra-dimensions and it acts like five-dimensional force, being indirectly proportional to fourth square of distance between spherical objects. Scientists are trying to find extradimensions while filtering out the phenomena, which are indicating them clearly. Is it a full moon or something? The looney tunes are out in full force today. What is the difficulty in simply blocking the effects of Gravition? This by itself should define the Multi-dimesional nature of the Propogation of Gravity. If this were not so, we should be able to simply shield the Acceleration imputed on the objects we are trying to work with. Geometry is a great tool with lots of descriptive power. My problem is with the fact that ultimately, the geometry used in physics is essentially arbitrary. There's nothing fundamental about a sphere - it's just an imaginary construct with a radius. For example, many physicists used to think that electrons were spheres. But when they tried to calculate the rotation of the surface, they found it must be greater than the speed of light. Now electrons are considered zero dimensional. A zero-dimensional point is still a geometrical construct. Indeed, anything that ever mentions "dimensions", or indeed any coordinate system at all (as in gauge equations...), is fundamentally geometrical in structure. If you ever talk of distances, vectors/momenta/velocities, polarization, and so on: you're inevitably talking geometry. I have to disagree with that... since you cannot have vectors in 0D. You can only have scalars. A dimension is an axes so without any axes you have no dimensions. A point is definitely not a geometric object, since it has no descriptive properties. This illustrates my point - if you pretend that the geometry used in your calculations is real, then you are stepping into a dangerous territory. This is very explicitly indicated by quantum mechanics and virtual particles replacing the force fields of classical mechanics. Sadly, many physicists seem to have learned the material but forgotten the lesson. For example, I am currently working on outlining a theory that has no dimensions at all - a zero dimensional universe. Nevertheless, I have already figured out a simple, emergent way that three dimensions emerge from the construct, as well as all the other relevant geometries. In fact, the most interesting thing is that ONLY three spatial dimensions are possible - it cannot produce more (although it can produce less in certain scenarios). Perhaps I was trying to be too terse (given the character limit.) I did not mean to involve vectors into discussion of points. Rather, with my talk of vectors, coordinate axes, etc. I was trying to point out that geometric notions are pervasive and absolutely unavoidable in physics. Even the wave equations of quantum mechanics are formulated in the context of coordinate systems. But as far as geometry, a point is indeed a fundamental geometric axiomatic construct. This goes all the way back to Euclid. Indeed, to talk about defining a point in the first place, you end up using concepts like dimensions or volumes. The entity in question can't be defined without using geometrical terminology in the first place. I swear I saw this article months ago ... can't wait for the results though. These results are known already: it's Casimir force. What else do you expect here? We are facing the situation, physicists are purportedly ignoring the most trivial connections for the sake of their further grants & employment. Albert Einstein: "It is open to every man to choose the direction of his striving: and also every man may draw from Lessing's fine saying, that the search for truth is more precious than its possession." If it so, it's not so surprising, the physicists aren't looking for truth, but for the opportunity of further research. The contemporary theories are valued not by their predicative or even explanatory value - but by number of physicists, which these theories are able to employ. Since it is vibration at the core of all of it, this means it is a quanta function as a torsionally spinning -thus vector resultant (of each component) interactive. Ie, live and constantly in motion or a interacting and very high frequencies, ie, quanta. Thus the geometry still plays in here. As experiments go, this one is cheap, and provides another data point for verification if anything promising comes up. There is also the promise of learning something new, though explanations may take a while. Note how naturally the inverse square force distribution arises. And no "gravitons" are needed. The comment is about gravity on an astronomical scale. Almost the same applies at the quantum mechanical level, but with a weird and surprising twist: gravity becomes a force of repulsion instead of attraction! The compound spin systems in the atom also have specific gravity-like effects, but are beyond the scope of this comment. i really wanna see what will happen then ... ! Casimir force is already well known and will have to be subtracted from the result. However the challenge will be to get an extremely low noise laser, as there will be quantum noise from the random photon hits. Also it will not actually be in a total vacuum, so there will be effects from the remaining gas. I hope this experiment succeeds. Casimir force is already well known and will have to be subtracted from the result. With ancient aether based LeSage theory the gravity is a product of shielding of virtual "ultramundane" particle flux. In modern interpretions the Casimir force is a product of shielding of virtual photons. Actually the mechanism of both these forces appears equivalent, so we can still subtract the Casimir force from the result - but such approach would correspond the proverb "The darkest place is under the candlestick". It is interesting to learn, electron also defines gravity, how a proton and a neutron?